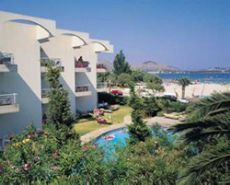 The Bellamar Apartments is situated at the beach in the enchanting resort of Puerto Pollensa, overlooking the beautiful bay, and 400 m from the village centre on the island paradise of Mallorca. Resting near the Serra de Tramuntana, this 3 Star property offers great value for money to couples and families featuring 27 comfortable one-bedroom apartments spread over 3 floors and surrounded by gardens and native vegetation with a swimming pool for adults and children with solarium, hammocks and parasols. Palma de Mallorca Airport is 60 km from the hotel. Local Tips: The area offers the widest range in any sport, sailing, windsurfing, kite surfing, water skiing, scuba diving, snorkelling, golf, cycling, hiking, nordic walking, bird watching, all in the declared a World Heritage site of the Sierra de Tramuntana. Food, drink and entertainment: Self catering apartments.